Centipedegrass (Eremochloa ophiuroides [Munro] Hack.) is a common warm-season turfgrass grown in Louisiana. It is popular among homeowners because of its low maintenance requirements. It is also favored because of its ability to grow in warm weather and acid soils with low nitrogen fertility. Centipedegrass is slow growing and spreads through stolons (aboveground stems). It can be established via seed, plugs or sod. 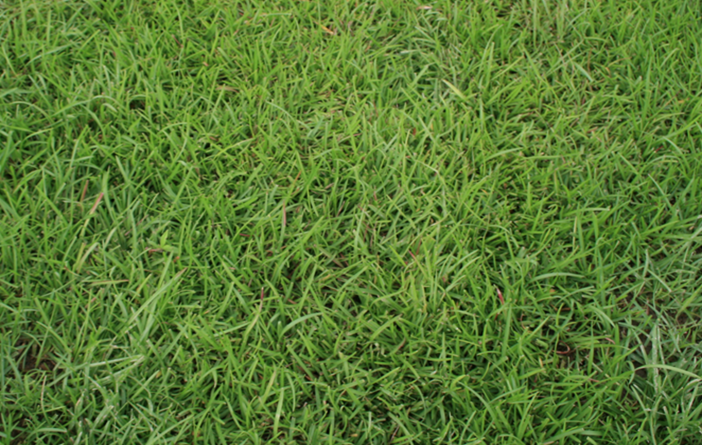 Centipedegrass is a medium-textured turfgrass with sharply creased, bright green leaves. Leaves are alternately arranged on the stolon and have a narrow, rounded tip. Centipedegrass has slender singular seed heads, which extend slightly above the leaf blades and produce small white flowers. It produces stolons (aboveground stems), which allows it to spread laterally. HINT: Centipedegrass can be confused with St. Augustine grass and carpetgrass. Note that centipedegrass has narrow, alternately arranged leaves compared to St. Augustine grass which has wide, oppositely arranged leaves and carpetgrass which has multiple spikes per seed head. Soil Type: Grows in various soil types where there is little compaction, good drainage and low nitrogen fertility. Soil pH: Prefers acidic (< pH 7) soils, ideally between 5 and 6. If soil is too basic (> pH 7), leaves can yellow. Always follow soil test recommendations to achieve desired soil pH. Light: Preforms best in full sun. Can tolerate light shade but will decline in heavily shaded areas. Growth Rate: Grows slowly and spreads via stolons. Mowing and Traffic: Mow at 1 to 2 inches routinely during the growing season. Never remove more than one-third of the leaf blade height at one mowing. Mowing at the appropriate height is key in preventing scalping and reducing weed encroachment. Increased traffic causes soil compaction that leads to centipedegrass stress expressed as purple to red leaves. Establishing centipedegrass in the lawn can be achieved via seed, plugs or sod. Sodding is the most commonly used method for centipedegrass establishment. Plugs: Purchase plugs or create plugs from sod and plant each piece about 1 foot apart. Irrigate, fertilize, and apply weed control as necessary until established. Plugs are primarily are used for establishing smaller areas.